Multi-geo is designed to be a feature that helps multinational organizations address local data residency requirements in parts of the world. With Multi-Geo these concerns are addressed by enabling a single Office 365 tenant to span across multiple Office 365 datacenter geographies (geos) and giving customers the ability to store their Office 365 data at-rest. As of April Multi-Geo is available for Exchange Online and OneDrive for Business. When a mailbox is enabled for Multi GEO a customers can choose were each user’s mailbox contents (e-mail body, calendar entries, and the content of e-mail attachments) is stored at-rest with the boundary’s being the GEO locations. For OneDrive for business, a customer can choose in which geo location each user’s OneDrive uploaded files are stored at-rest. When the multi GEO feature was still in preview Microsoft demanded that for a tenant to be enabled there should be at least 10K users licensed in the tenant. On top of that each GEO location enablement would also cost a 30.000$ per month fee. These were huge requirements and a show stoppers for medium sized company’s. Now with the release the model has completely shifted and Multi GEO becomes a option for medium sized company’s. The new model has a lowered requirement. You are now required to have at least 5.000 seats in you tenant and a minimum of 250 seats should be enabled for multi Geo. The cost model no longer has a monthly fee but it shifted to a per user payment model of 2$ per user per month. Now with the 250 seats requirement this means that you can get this new functionality for only 500$ per month. Do note Microsoft still has the requirement of at least 5% of users need to be multi tenant enabled. As your company grows or more users get onboarded you may start to violate this requirement. If you want to enable multi Geo you can buy this as a add-on to your normal office 365 plans. Do note however it is important that this is not a latency or performance solution. this is purely to meet data at rest policy’s for Exchange online and OneDrive for business. Microsoft is also working on making multi-geo available for SharePoint Online and Office 365 Groups and is exploring multi-geo for additional Office 365 applications. The following picture shows the availability of regions as multi Geo locations. 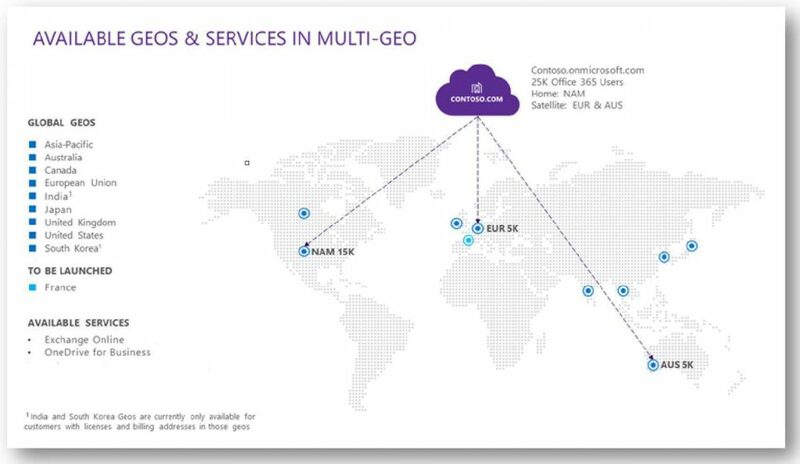 Before you can start using your tenant as a office 365 Multi GEO tenant Microsoft needs to enable the customer’s Office 365 tenant for Multi-Geo. When the tenant is enabled and licenses are assigned you can use either PowerShell or AAD-Connect to provision or move users between regions. this is done by provisioning the region code to the PreferredDataLocation attribute. The timing for enablement depends on factors such as the size of the customer Office 365 directory and availability of move resources. The Office 365 admin center will notify when Exchange Multi-Geo enabled.